H.P. Smith worked at the prison in various capacities from May 1, 1893 to June 30, 1910. He began his career as a guard. After six years on the force, he was promoted to Foreman of Masons. 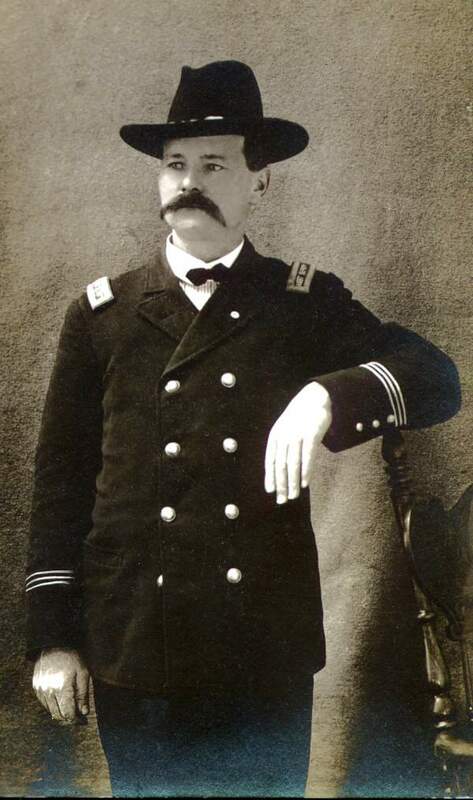 In 1900 he was elevated to the position of Assistant Deputy Warden and, finally, Deputy Warden. He held this final post for six years until leaving employment. The following images were graciously shared with us by his descendent, James Smith of Bend, Oregon. The single image is H.P. Smith. The group photos show two groups of employees, probably representing two shifts, posing in front of the administration building, taken circa 1905. Smith is in the upper photo, front and center, with rank stripes on his sleeves. The group photo is an "image map." Click on any segment containing employees for a magnified view of that portion. On the far right of the upper photo is an interesting area showing construction of North House. It appears the roof isn't yet installed. Note the board containment fence around the construction area. The frame house on the right was the Warden's residence.